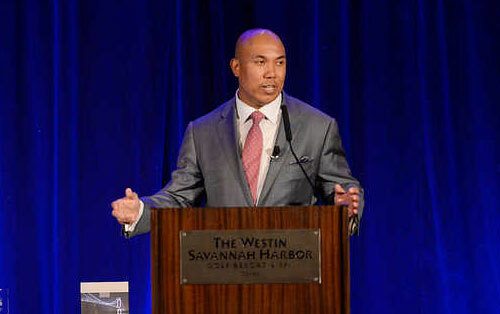 SAVANNAH GA. — Former Pittsburgh Steelers wide receiver, Hines Ward, was the keynote speaker on May 21, 2014 at the Savannah Morning News’ fourth annual Best of Preps banquet. The event was held at the Westin Savannah Harbor Golf Resort & Spa located at 1 Resort Dr in Savannah, GA. According to Savannah Morning News’ Donald Heath, to cite sources, Ward spoke at the sold-out banquet which honored the top high school athletes in Chatham, Effingham, Liberty and Bryan counties. It was the first time Ward, an Atlanta native and former football star at the University of Georgia, had ever been to Savannah. It was a night to learn lessons and be entertained, and Ward delivered. Hines Ward is a retired wide receiver who played fourteen seasons for the Pittsburgh Steelers. He was voted MVP of Super Bowl XL, and upon retirement was one of only eight NFL players to have 1,000 or more career receptions. Besides his career in the NFL, Ward also appeared on the reality TV series Dancing With The Stars where he won the Mirror Ball Trophy. He is currently a studio analyst for NBC’s Football Night in America.